mostly of one type known as a-Proteobacteria, although representatives of b-Proteobacteria were occasionally abundant (McNamara and Leff 2004). in fine benthic OM (Figure 7.7). 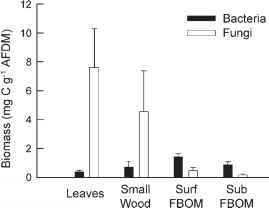 Because fine benthic OM was more abundant than coarse detritus at the study sites, when bacterial biomass was weighted for the abundance of detritus in the reach, it was similar to or higher than that of fungi. In addition, bacterial biomass was less variable per unit of OM mass than fungal biomass, suggesting that bacteria could be a more reliable food resource than fungi. production were always dominated by fungi. The bacterial contribution increased in treatments where fungi were excluded, suggesting competition between bacteria and fungi for resources. This interaction may be symbiotic as well, as Gulis and Suberkropp (2003) also found evidence that bacteria may benefit from fungal activity during leaf decay. When leaf disks that were treated with antibacterial and antifungal solutions were incubated in two tropical streams in Venezuela, results indicated that fungi contributed more to total microbial biomass than did bacteria, while bacterial were responsible for a higher proportion of total microbial respiration (Abelho et al. 2005). In a tropical headwater stream in Puerto Rico, leaf decomposition rates were faster when both bacteria and fungi were present, compared with treatments in which one was excluded. 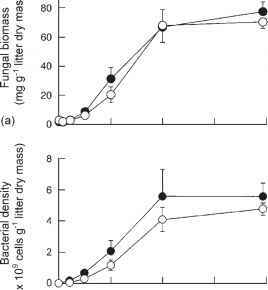 However, fungi reached higher biomass alone than in the presence of bacteria, suggesting an antagonistic effect (Wright and Covich 2005). This indicates that the interaction between bacteria and fungi can be synergistic in facilitating leaf decomposition but antagonistic in the mutual demand for a C source. Leaves undergo a number of chemical changes as they decay. Nitrogen typically increases as a percent of remaining dry mass and sometimes increases in absolute terms as well. Because protein complexed to lignin and cellulose is very resistant to breakdown, N compounds remain while other leaf constituents are lost, resulting in a relative increase. Microbial immobilization from external sources can also lead to increases in either relative or absolute quantities of N or P. When increases in total N are recorded, this immobilization of N usually is attributed to an increase in microbial biomass and incorporation of N from the surrounding water into new protein. 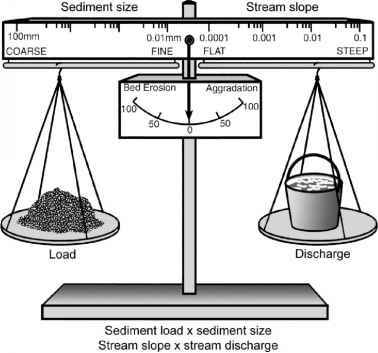 In a headwater stream reach in Coweeta Hydrologic Laboratory, North Carolina, that received additions of ammonium, nitrate, and phosphate, N content of maple (Acer rubrum) and rhododendron (Rhododendron maxima) leaves increased significantly relative to a control (Figure 7.8), suggesting higher microbial biomass under enrichment conditions (Gulis and Suberkropp 2003). 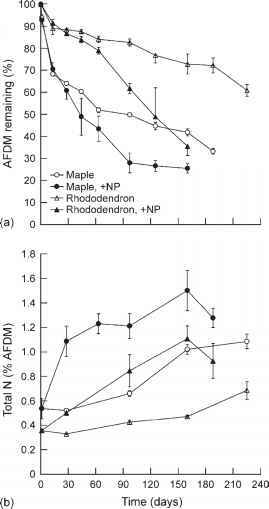 The slower breakdown of rhododendron leaves compared to maple is attributable to their lower initial N content and lower surface area relative to leaf volume. 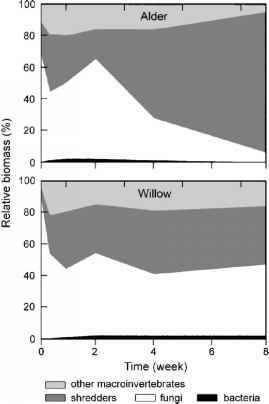 In a study of oak and hickory leaves incubated in a Michigan stream over the winter (Suberkropp et al. 1976), cellulose and hemicellulose declined at about the same rate as total leaf mass, while lignin was processed more slowly and increased as a percentage of remaining weight. Lipids were lost more rapidly than total mass, and thus were a declining fraction of remaining dry mass of leaf material. mass. Soluble protein also decreased after November, indicating that nutritional value declined from that time on. However, on any one date, the quality of individual leaves was so variable that the amount of soluble protein in the richest 10% of leaves in mid-April exceeded the median value of leaves sampled in mid-November. Detritivores capable enough or fortunate enough in patch choice could enjoy food quality well above average.